Holman Consulting helps nonprofit organizations located in New York city with strategic planning and fun raising efforts. 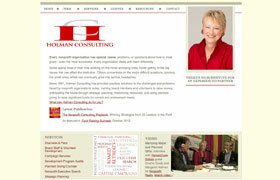 Holman wanted a website redesign reflective of the leadership position they maintain and a new brand identity to differentiate itself without losing Holman’s unique flavor. ActiveCanvas repurposed their content to make their various services easy to understand and act upon. We designed a soft warm color palette with red accents, Holman’s signature color.